I just purchased all three of the Norwegian Kveik produced by Omega Yeast Labs. 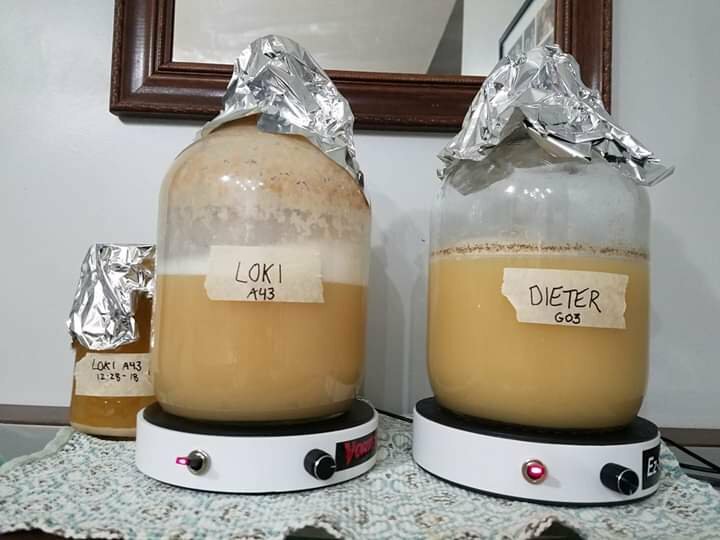 I am interested is hearing about other brewers experiences with this yeast, what styles have you brewed with the yeast, what you like and dislike about the yeast. I would like to also know if any brewer has experimented with brewing a traditional Norwegian recipe. I found a couple of articles and videos where you steep Juniper branches in the mash water as it heats and remove them when the temp has been reached. I am looking at brewing a traditional Norwegian recipe for my mothers birthday, she is 100% Norwegian and I think she would enjoy a nice session brew. I have used the Voss Kveik yeast a few times. I have brewed a cream ale type, session IPA and a double IPA with it. I like the orange character it imparts in the beer. It works well with citrusy and tropical fruity hops. I have not brewed a traditional Norwegian recipe. Although, it sounds like it could be fun & interesting. 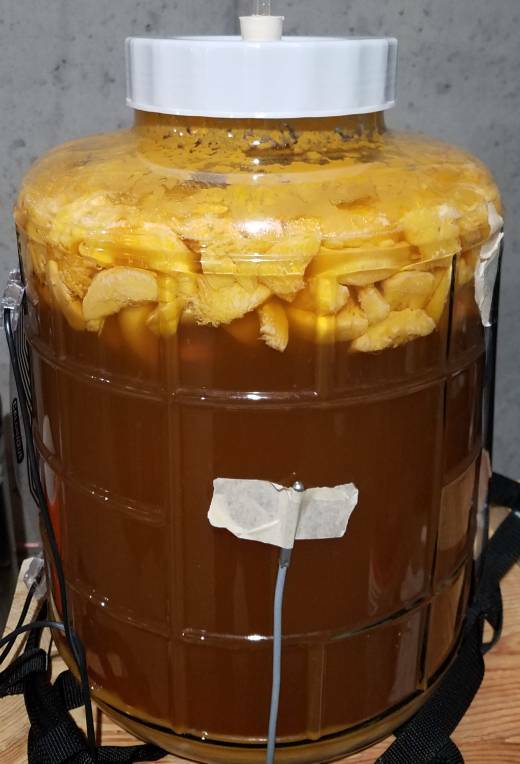 I brewed a 5 gallon batch of a peach ale with Imperial Loki. I'm not sure though if this kveik is the same as any of yours. Mine was a CLIMBER. Lots of krausen, even with just a starter. It also took extremely warm ferment temps without producing anything hot. I pitched at 70°F and ramped to 80°F. I overbuilt my starter to harvest and store some. Contemplating what to brew next. Pictured here is the starter compared to a German ale strain. You can see where the krausen touched. 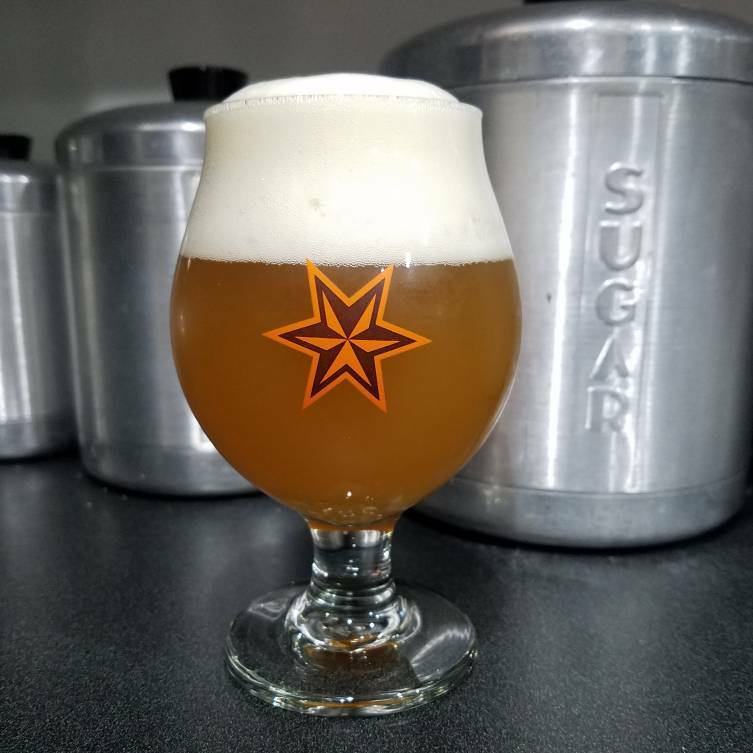 Also, the peach ale made with Maris Otter, oats and some 10L crystal. Fruit additions 10lbs of peaches and 3 lbs apricot puree. Drinking it now. Very tasty. I've used it several times, and found the esters work well with hops. I'm trying to brew something slightly more traditional and less hoppy, and I'm planning on brewing with spruce tips later in the spring. I've definitely noticed that kveik takes off hard. I split a batch the other day (Fermenting at 65F and 93 F), both were at ~1.020 within two days, and they're sitting at 1.017 (75% attenuation now). Lost about a liter of beer through my blowoff tube. Wilber, I will be very interested how the spruce tips work out for you. I am also planning to brew this in the spring. I am in Montana and it is a little to cold to brew outdoors right now. I am going to continue researching a recipe for a traditional Norwegian brew and hopefully come up with something worth drinking. Some of my club members went up to NHC and brought back some fresh spruce beers and really opened up my eyes. I think the only one I've had before than was from Rogue, and probably wasn't the freshest as I'm in Central IL. There was a herbal/pine kind of flavor, but also a delightful blueberry/fruity kind of undertone. Was going to brew a Bier de garde but at the last minute, used Kveik Voss in the recipe . Taste great while bottling. Citrusy & malty. Needs 2,3 weeks to carbonate. Fermented at about 20 C.
I found a couple of articles and videos where you steep Juniper branches in the mash water as it heats and remove them when the temp has been reached. Here in Norway we traditionally steep the juniper before mashing. The juniper tea is called einelaag. There are as many opinions as there are brewers. Some uses tips only. Some uses branches. Some uses the thicker stems. Some prefere branches with berries. Some steeps just a short while. Others overnight. Some uses juniper as filtration media in the mashing tun. So go ahead and find your own favorite. In general, a short steep gives a lighter fruityer einelaag. A longer steep brings out more pungent flavors. If you go above 165 farenheit, it may produce overly bitter einelaag. Ronnal, Thanks for the input on the juniper branches. I'm in Montana and it's a little to cold for my brew setup right now, but using this down time to research this type of beer so when the spring thaw hits, I'll be ready. My mother is 100% Norwegian and I am looking forward to introducing this beer to her. I hope to make it to Norway one of these days. We still have distant relatives in the northern region of the country and would love to explore my families heritage. Thats cool! I grew up in the north. Where I grew up there was not a great deal of time old traditions brewing beer. Propably as grains (or hops) dont grow in the region. Where I currently live its traditions to brew raw ale. I recommend Lars Marius Garshols blog about brewing. Lots of good stuff there. Here is a couple of links. I would love to sample some of your raw ales. I spent about three weeks on a Norwegian air base in 1968 near the fjord above Trondheim (perhaps Vaernes) but I don't remember. I was a flight crew member on a P3A Orion patrol aircraft. Some of our crew took the hydrofoil ferry down the fjord to Trondheim. It is a very beautiful city as is the countryside along the fjord. I admire your citizens and your beautiful country. Here where I live in the south western part of Norway (on an island named Karmøy). There are a tradition for brewing Raw beers (unboiled beers). The trick (for us modern brewers) is to heat the wort to a temperature above pasteurization temp and below temperatures that converts smm into dms. That is heat the wort to a temp between 72-80°C. Keep it there for 10-15 min and then chill to pitching temp e.g. 35°C and pitch your kveik. (on an island named Karmøy). There are a tradition for brewing Raw beers (unboiled beers). That is very interresting, I was not aware that there is traditions for raw ale south of jostedalsbreen. I am intrigued to ask, do you use a kveik from tge yeast registry, or do you have your own personal jesus, I mean kveik? And is the raw ale brewing wide spread on Karmøy and the area around? I myself mash in at 72 (162) degrees, thus pasterurising the wort, spargewater is over 65 (150). I just let it cool naturally to pitching temp.